Like our small-frame JPBC-1, this carrier is the ultimate game gun operating system, now available for your heavy metal rig. 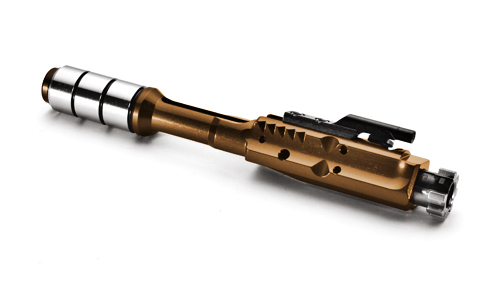 The JPBC-8 offers an extremely light recoil impulse with minimal sacrifice in reliability. The JPBC-8 also pulls from the advances of our JPBC-7 VMOS™ carrier. This standard version of the aluminum large-frame VMOS carrier includes three steel weights, two of which can be exchanged for heavier tungsten weights. Package includes carrier, bolt assembly, cam pin, titanium firing pin, firing pin retainer pin and instruction sheet. Use of a hammer with a radiused leading edge such as our JP Speed Hammer is recommended. Use with a Silent Captured Spring assembled with a lighter weight spring will produce superior results.